We’re back for the fall season with Linda Civitello and “America Takes the Cake” on September 9! Cake—what would weddings and birthdays be without it? Pre-19th century cakes were just yeast bread tricked out with eggs, sugar, and spices. Then American women radically reinvented cake using baking powder. How did recipes and information about the technology for this new cake circulate? Most importantly, how did we arrive at the quintessential American cake—chocolate. Sample cake from its various incarnations, including historic 18th century gingerbread made with heirloom flour from Pasadena’s Grist & Toll. 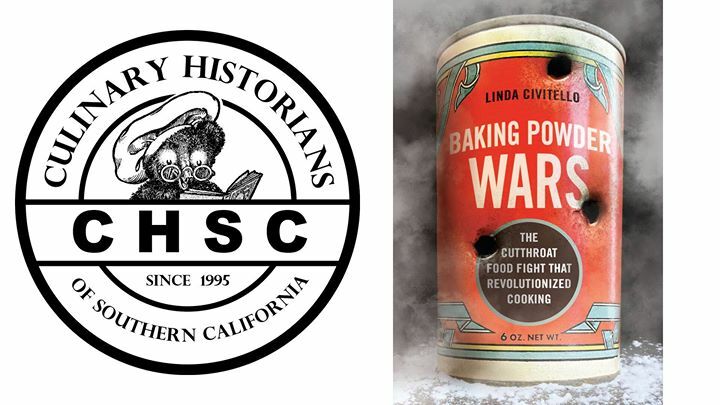 Linda Civitello is the author of Baking Powder Wars: the Cutthroat Food Fight That Revolutionized Cooking, which Eater named as one of its 10 Must Read Books. Linda is also the author of the award-winning Cuisine and Culture: a History of Food and People. Linda has taught at culinary schools throughout Southern California, and taught the History of Chocolate at UCLA Extension. She has four essays in Savoring Gotham, including “The Oyster Bar at Grand Central” and “Windows on the World.” Linda has appeared on TV on Bizarre Foods and on the BBC’s Who Do You Think You Are? She writes the food history column for Edible Los Angeles, and is currently writing a book on Screen Cuisine: Food and Film from Prohibition to James Bond.